Direct costs (also known as costs of goods sold—COGS) are the costs that can be completely attributed to the production of a specific product or service. These costs include the direct expenses for materials used to create the product, and potentially any labor costs that are exclusively used to create the product. Direct costs always exclude indirect expenses such as marketing expenses, rent, insurance, and other similar expenses. Direct costs (or cost of goods sold) shows up on the profit and loss statement and can be subtracted from revenue to calculate the gross margin of a company. Cost of goods sold (COGS) is a great alternative name for direct costs because it refers to the cost of creating the products that a company sells. If you sell services, you probably also have direct costs, but they will be a much smaller percentage of your revenue than they will be for a product company. More on that in a minute. For example, a coffee shop would include the costs of coffee and milk in their COGS. The coffee shop would not include things like marketing costs, rent, and internet access in their calculation. Think of direct costs as the exact cost you incur to sell one of your products. You had to either make or buy the product you sold. You may have had to purchase raw materials that you then turned into a product. The costs of producing what you sell are your part of your COGS. What about labor? Deciding what to include in your direct costs varies from one type of business to another. A car company may decide to include manufacturing labor costs for assembling their cars, while a software development company might include labor costs as an indirect cost. Direct costs are expensed as you sell your product or service, so most companies choose to exclude labor costs from COGS. The reason for this is that your company is incurring the expense of having staff on hand even if you don’t sell a single product. Also, that staff might work on multiple products and multiple projects, so it’s difficult to determine exactly how much of their salaries should be attributed to producing a specific product. As a general rule of thumb, if you can’t directly associate a specific cost with the sale of a single product, then that cost should not be a direct cost. That’s why things like rent and marketing expenses are typically considered indirect. While product companies typically have higher direct costs because they are dealing with physical goods, service companies’ direct costs are usually fairly low. For example, a consulting company may provide a client with a 100 hours of consulting that culminates in a final report. If that report is printed and bound, then the direct costs of delivering that consulting are the cost of paper and binding. The primary expense of delivering the consulting project is the labor that went into the project. And, since that labor was probably paid for in the form of salaries, it wouldn’t be included. Understanding direct costs helps you keep an eye on how much it is costing your company to deliver its product or service. If they are going up, perhaps your suppliers are starting to charge you more, or perhaps fuel costs are going up. When your direct costs go up, it might be time to start looking for new suppliers or to try and cut costs in your business. Because gross margin is a good top-line measure of how efficient your company is at delivering its products and services, keeping an eye on your direct costs helps you understand how efficient your company is. What’s better? Higher or lower direct costs? Typically, having lower direct costs is better. That means that you are delivering your products and services very efficiently and can have a solid gross margin. Having low COGS can impact your business in many ways. You could pass on your savings to your customers and offer lower costs than your competition. Or, you could look to reinvest in your company and boost your marketing and sales efforts. Or, let the savings flow all the way to the bottom line and boost your overall profitability. Either way, low direct costs have a positive impact on your business and you should strive to push the number down. Find a new supplier or vendor: It’s always good to comparison shop. Maybe you can get your products and supplies from a new supplier for less. Maybe you can shop around and get lower hosting costs for your online service. Renegotiate with your existing vendors: It’s easy to stay with vendors you know, and you can save a lot of business disruption by staying with the same suppliers. So, instead of switching to a new supplier, you can always ask for better pricing. Sometimes the threat of leaving is all you need to get better pricing for your raw materials. Find efficiencies: If you’re a manufacturing company, perhaps you can remove a step from your process, or you can figure out a way to reduce costs in your process. One of the best ways to find efficiencies is to ask the people who actually work on the manufacturing process. They’ll know where the waste is and how to lower costs. Understanding direct costs and how you can lower them is an important part of running and growing your business. Lowering them will increase your gross margin and have a positive impact on your profits, so this aspect of your business financials worth taking the time to understand. For more business concepts made simple, check out these articles on cash burn rate, net profit, operating margin, accounts payable, accounts receivable, cash flow, profit and loss statement, balance sheet, and expense budgeting. 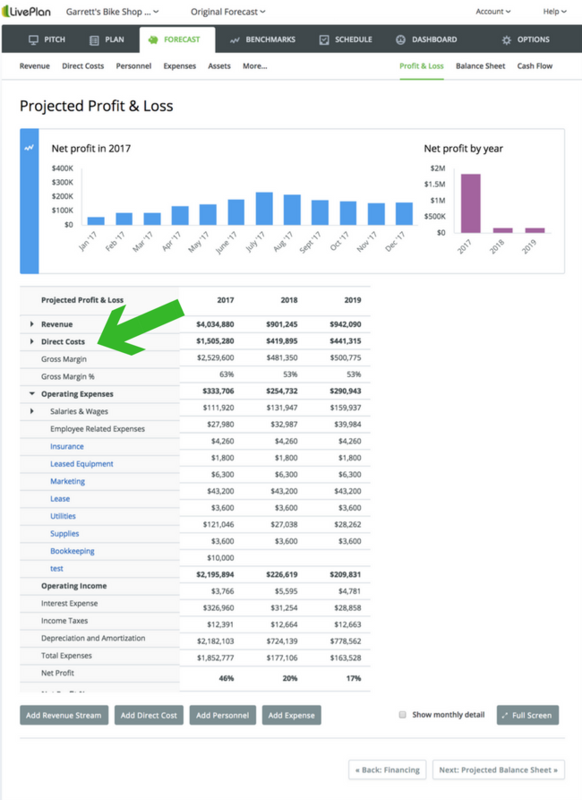 You can also download our free Balance Sheet Template, Profit and Loss Template, and Cash Flow Template to easily create these financial statements on your own. If you’ve managed to lower your direct costs, or if you have any questions at all, tell me about it on Twitter @noahparsons. Editor’s note: This article was originally posted in January 2015. It was updated in July 2018.